1. That which restricts an action; either by a regulation or a strict discipline: "The teachers were compelled to impose specific inhibitory behaviors for students." 2. Tending to stop or to slow a process; such as, a neuron that suppresses the intensity of a nerve impulse. 1. A condition in which the action of one group of a pair of antagonistic muscles is inhibited by the excitation of the other group, as when the biceps are prevented from contracting and bending the arm at the elbow while the triceps are extending the arm; a result of reciprocal innervation. 2. The inhibition of an anxiety-provoking response by the practice of deep muscle relaxation. 3. Behavior therapy in which the patient is exposed to anxiety-producing stimuli while in a controlled state of relaxation so that the anxiety response is gradually inhibited. In psychiatry, a form of behavior therapy in which the patient, while made to relax in comfortable surroundings, is gradually exposed to increasing amounts of anxiety-provoking stimuli. In this way the patient can tolerate these stimuli and may eventually learn to dissociate the anxiety from them. 1. To return someone back to a normal, healthy condition after an illness, an injury, a drug problem, etc. by means of education or therapy: George was rehabilitated from being a former criminal to a respected worker at the local bank. Glenda was rehabilitated to good health again as a result of medical treatments and therapies. 2. 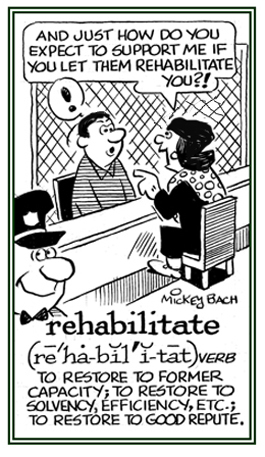 Etymology: from Latin re-, "again" + habilitare, "to make fit." © ALL rights are reserved.